Located strategically near the historic Old Delhi as well as the central business districts of Delhi, Ghaziabad and Noida, The Leela Ambience Convention Hotel is the ideal destination for both business and leisure travelers to the NCR region. Splendidly luxurious in its welcome, the hotel also offers the choicest dining options. Currently on is their Grand Trunk Culinary Journey Food Festival, a unique food adventure that traverses the Grand Trunk trade route, bringing you mouth watering delicacies indigenous to the various stops along this route. Dilli 32, Leela’s Indian restaurant now offers to you cuisine from the culturally rich, very majestic Old Delhi, as this becomes the second pit stop of the journey. The festival is on from April 29 to May 9. Chef de Cuisine, Ashwani Kumar Singh and his wonderful team have spent months researching, tasting, recreating and perfecting age old recipes to bring back the authentic charm of a bygone era. Chef Rohit Tokhi, General Manager Jaideep Anand, and PR Manager Deboshree recently hosted a most splendid lunch for a select group of bloggers at Dilli 32 and it was indeed a pleasure to be invited for this very special experience. I will come to the food shortly, but I must make mention of historian and storyteller par excellence, Asif Khan Dehlvi, who was quite the star of the afternoon. He regaled us with tales of Old Delhi, the rich history, culture and his anecdotes on how certain practices came into being were truly engaging and kept the meal lively and enthralling. We were welcomed into the restaurant with a fine delicate drop of itr on our wrists, in keeping with the Old Delhi tehzeeb. Delightful Rose Sharbat, Aam Panna and Nimbu Paani awaited us – the perfect thirst quenchers and refreshers in this terrible heat. Though they were all quite too sweet, the flavours were really good. The meal began with a course of select appetizers. The Shami Kebab was beautifully flavoured, gentle on the palette with its delicate textures and mild spices. The Burra, a speciality mutton kebab was succulent, soft and perfect. I tried a Pateli Kebab for the very first time. I suggest you not miss this absolutely delightful and unusual preparation. The Anmol Roast Chicken was rather good too, a throwback to Jama Masjid lanes, bursting with rich flavours. The vegetarian palette was also very carefully curated for. 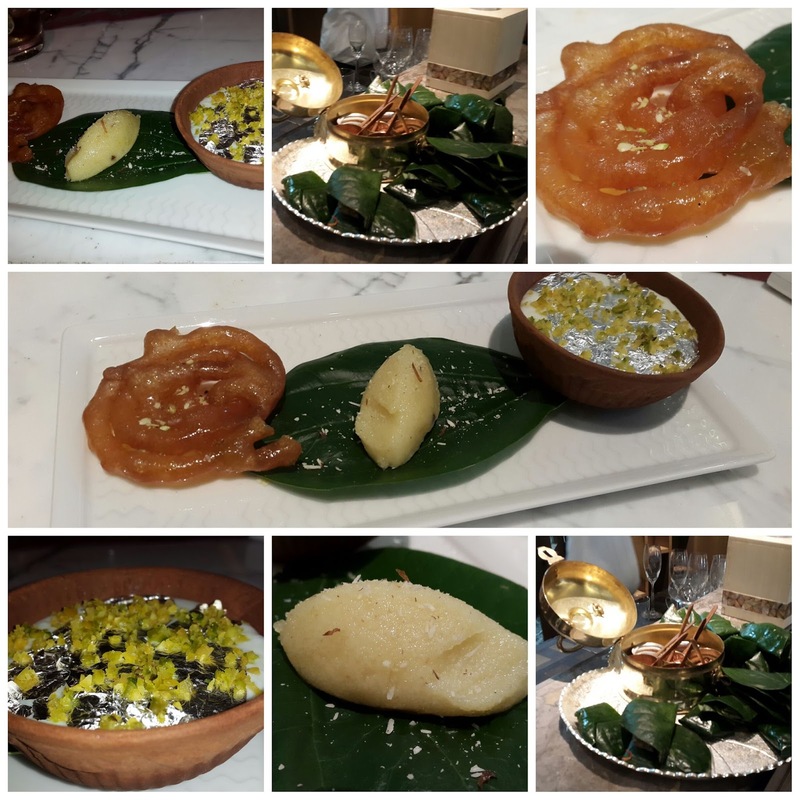 The Kathal Ki Shammi was absolutely unique as was the Dry Fruit ki Chat. The Aloo Chat and the melt in the mouth Dahi Bhallas quite literally make one feel they are eating in some purana bazaar in a quaint corner of purani dilli. The main course too was a meal fit for royalty, what with Raan e Jahangiri, Aloo Gosht ka Salan, Chicken Changezi and Mutton Biryani supported with the equally exotic vegetarian counterparts like Arvi ka Salan, Aloo Katlian, Take Paise and Dal Arhar Kaeri. Each flavor was distinct, powerful and left its own mark. Unforgettable flavours truly! And many of the young generation would not have ventured into trying these at all so far. Coming to breads – my absolute favourites were the Sheermal, Khamiri Naan and the Doodh Cheeni ki Roti because I just love my bread kind of sweetish. There were also some delightful lachha parathas, besani roti and Bedmi Puri Bhaji. We were told a very interesting story about the Besani Roti. Why don’t you look up Bahadur Shah Zafar and Besani Roti. The story will definitely be a new addition to your bank of stories to tell, I promise! Well the meal had us rather squarely stuffed, but like I always say, meetha has its own special section in our tummies! So I tucked into the Jalebi, Gulathi and Gudamba with full gusto. Want to know what they were like? Don’t know what Gulathi and Gudamba are? Go for this festival I say! You will come back happy, satiated and with new respect for our kamaal ki dilli!